Rubovits-Seitz continues with his own insightful analysis of Kohut's distinctive approach to Freudian theory. And he concludes by arguing persuasively why Kohut's later contributions should best be viewed as a continuation, rather than an abandonment, of this early vision. 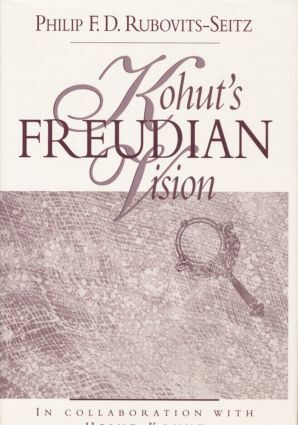 Kohut's Freudian Vision not only repairs an outstanding tear in received psychoanalytic history but also challenges self psychologists and contemporary Freudian psychoanalysts alike to renewed reflection. 7. Primal Repression and "Actual Neurosis"
Philip F. D. Rubovits-Seitz, M.D., is Clinical Professor of Psychiatry, George Washington University Medical Center, and Member of the Washington Psychoanalytic Society and Institute. He was previously Director of Psychiatric Research, Indiana University; Visiting Professor of Psychiatry, University of Cincinatti; and Staff Member, The Chicago Institute for Psychoanalysis. He has received a number of national and other awards for research and teaching.